As far as I'm concerned, using a zoom microphone for run and gun filmmaking is a no-brainer because my crew (usually consisting of one or two people on audio) can capture clear sound without wasting a lot of time on set-up. I could even go it alone if necessary since the equipment is lightweight and portable. It's also simple to transfer the audio file for editing. And if I use my camera's sound to sync the two, it's easy to integrate the zoom microphone footage with my video footage. What Is a Zoom Microphone? The concept behind any set-up with a zoom microphone is omnidirectional sound capture. If you want to grab quality audio while you're on the move, then a zoom microphone might be what you need, as well. Plus, there are lots more ways to use a zoom microphone, and there are models to suit most situations. In addition to being a type of transducer configuration, Zoom also happens to be the brand name of a well-known and reputable manufacturer of lightweight, portable, recording devices that incorporate built-in multi-directional microphones. Zoom microphones are essentially mini recording studios used for filmmaking, interviews, live music events, podcasts, concerts, lectures, and in pretty much any situation where good clean audio is a priority. The system records sound from three points: left, right, and center, otherwise known as X/Y recording. Zoom microphones can capture audio that can be isolated and output as mono, stereo, and surround sound. You can purchase a Zoom microphone, or a comparable transducer depending on your specific needs. They're easy to find online at Amazon or any audio supply outlet. You can also shop locally at a brick and mortar location such as Best Buy. Here's a clever microphone for your iPhone or iPad. Essentially, the Zoom iQ6 turns your phone or pad into a handy device for field recording, without having to make a considerable investment in equipment. The Zoom iQ6 and the newest iQ7 use Apple's lightning adaptor to enable the device as a plug and play. The company claims the lightning extended adaptor is useful in that it makes the connection accessible enough to plug into your i-equipment even if your phone or pad is in a protective case. You can use this Zoom microphone with audio apps that support input from other sources too, such as your camera, iMovies, or Instagram. A free app is included that allows you to turn your i-product into a mini recording studio by enabling you to edit your sound file and add effects without having to use any additional equipment. There aren't a lot of reviews on Amazon regarding the Zoom iQ6 or the iQ7. However, 40 percent of the 166 customers who did review this microphone rated the set-up at five stars. All in all the Zoom iQ garnered an overall rating of 3.2 out of 5 stars. That's a little disappointing for a product that has so much potential. You can check out a sound comparison of the two versions of the iQ Zoom below. Specifically, customers complain about the cheap plastic and faulty connection, as well as unwanted noise like buzzing, popping, and cracking. They also agree that leaving the case on your phone won't work as advertised due to the flimsy connection that the extended adaptor creates. However, in a top review that discusses the good and bad, one customer states that it is essential to put your phone, or pad on Airplane mode to solve the unusual noise issue. The lightweight and portable Zoom H1n microphone is a step up from its predecessor, the H1, which is no longer in production. However, the H1 microphone can be found on clearance for under a hundred at Best Buy, as well as Amazon and other online outlets. The improvements with the Zoom H1n include an upgrade to its casing, which gives it a more substantial and professional feel. It also has a USB port and a cage around the microphone to protect the instrument from damage as well as cutting down on unwanted noise. We recommend using an additional furry or foam windscreen on all microphones to muffle background noise and wind further when it's an issue. Like the original H1, this little beauty also offers up to 10 hours of continuous recording time, and 90-degree x/y microphones that make recording simple in a variety of settings. One-touch button control makes it easy to use, and the monochromatic LCD means that you'll be able to read the meters even in bright conditions. Musicians will find this handy field recorder works well for demos too, and with a line out for headphones, you can listen while you record. The onboard limiter and low-cut filter reduce unwanted noise and offer clear recording up to 120 dB SPL. Additionally, the H1n Zoom includes playback speed control, extensive over-dubbing, and a built-in audio syncing slate generator; not to mention a mic plug-in in case you want to use a lapel or directional microphone. Zoom's H1 is still getting great reviews on Amazon, and the 2018 version, the H1n, is a best seller. Between the two models, they have over 1,300 customer ratings, resulting in a rating of 4.3 out of 5 stars. Customers love the Zoom H1n's versatility and excellent sound quality. They also appreciate the external mic jack, especially for using a lapel mic. On the downside, even though Zoom upgraded the casing, the major complaint remains that the product is plastic and cheaply made. Aside from the iQ6, this Zoom microphone is the least expensive on our list, and, overall it does an excellent job for the price. Zoom's H4N PRO microphone has an ergonomic rubberized body. Thankfully, they didn't use the cheap plastic housing that we heard about with the Zoom H1n. This model offers four-channel recording, with upgraded X/Y stereo microphones that handle up to 140 dB SPL and can get low at minus120 dBu EIN. There are two XLR ports for additional microphones, and you can record straight to an SD or SDHC card up to 32 GB. Customers on Amazon rave about the Zoom H4N, giving it a rating of 4.5 out of 5 stars with 1,100 reviews. Professional sound quality is the number one pro regarding this model. Customers say it's the best in its category, offering great audio at a reasonable price. They also appreciate that the built-in microphones can be adjusted and that there are two additional ports. Of the handful of bad reviews the H4N received, the biggest complaints are regarding the software. If you want to utilize the four-track recording option and separate the channels, you will need the free Audacity software, or something similar, to split the built-in stereo mics into mono tracks. Also, if you need to move fast when recording an event, then this might not be the right model. This microphone takes a while to boot up, and according to the critics, the sampling rate is lower than advertised. The Zoom H5 offers true flexibility with a detachable X/Y stereo microphone that is interchangeable with six microphone capsules, ensuring the right set-up for your recording needs. The X/Y microphones, housed in a shock mount that uses a rubberized material, isolates the microphone configuration from the H5 body to cut down on vibration and noise from the instrument. You can attach this Zoom microphone to your DSLR camera with the addition of Zoom's Hot Shoe mount. There is a line out for headphones and another one to use on your video camera or other devices. Additionally, the USB port can be used as an audio interface for your laptop or iPad. A whopping 78 percent of the 199 reviews posted on Amazon give a 5-star rating to the Zoom H5. The result is an overall rating of 4.5 out of 5 stars. A top review applauds its simple operation, integrated pushbutton switch, and its voice-activated recording with a retroactive feature. It's built tough and comes with a protective case. Although it's a little bulkier than the previously reviewed Zooms, it's still portable. Of the complaints, the biggest con is that it doesn't pick up softer sounds without the need to adjust the gain higher, and this causes some unwanted noise. The gain problem can be solved by adding a pre-amp, according to the review. This one actually came before the Zoom H5. The Zoom H6 is the first portable recording system to offer interchangeable input capsules, which switch out as quickly as a camera lens. For example, you can attach this microphone to your DSLR or video camera with a hot shoe mount, and exchange the X/Y stereo system with the shotgun mic attachment to achieve directional recording for dialogue. The stand-out feature for this model is its extra large, two-inch display screen. It can take 128 GB SD card, and it offers six tracks of simultaneous recording. Amazon customers appreciate the Zoom H6, giving it a rating of 4.5 out of 5 stars. Exceptional quality is what we see in this model. Customers are delighted with its ergonomics and sturdy casing and the ability to "swap out mics." It's also easy to mount on a tripod. On the flip side, downloading software may be a challenge, and if you want to do multi-track recording, the fact that you can't punch in sound can cause issues, according to one unhappy musician. We picked the top-selling Zoom microphones and searched for comparable brands. What we found was that Zoom microphones are pretty unique in their set-up and the only real competitor we could determine was TASCAM. So we picked two models, comparing apples to apples, and this is what we found. We didn't locate a worthy comparison for the Zoom iQ6, mostly because Zoom is unique and working to put out a product that is compatible with newer model iPhones and iPads. For this reason, the iQ6 and theiQ7 stand out as the omnidirectional microphone for your i-devices. Likewise, few devices match the versatility and portability of Zoom microphones. 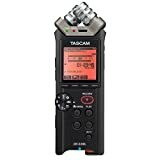 This TASCAM has the zoom microphone set-up that includes X/Y stereo mics and also comes with 2.4GHz Wi, used for streaming playback and transferring files. The scene dial presets are handy for a faster setup. TASCAM DR-22WL uses a micro SD, SDHC, or SDXC card; up to 128GB. It also has the option of a USB port for transferring files. Amazon customers give this handy little recorder, with its built-in X/Y condenser microphones, a 4 out of 5-star rating. Compared to the Zoom H1n, TASCAM holds its own with excellent recording quality, a monotone LCD screen, and it's small enough to fit in your pocket. Critics say that it can be unreliable, or buggy, sending a message, for instance, saying the batteries are low when they aren't. Customers also complain that the Wi-Fi is subpar. Adjustable mics and four-track recording are the highlights of the TASCAM DR-40. Unlike the comparable versions of Zoom microphones, there aren't any "capsules" to exchange with the built-in microphones. Features that make this TASCAM unique are the XLR mic or line inputs, and the internal mics are adjustable from XY to AB position. It also includes microphone preamps with phantom power and can record up to 96kHz with 24-bit resolution. The DR-40 uses SD or SDHC cards up to 32GB. There are 668 reviews on Amazon that pull in a total of 4.3 out of 5 stars for TASCAM's DR-40. Among the positive comments, customers claim that the DR-40 is comparable to the Zoom's H4N, is sturdier than the Zoom, and has a lower price point. However, they also admit that the H4N has a quieter preamp, and is better for using multiple tracks. Previous articleThe Blue Snowball Ice Reviewed: Is It Worth the Hype?